Our seventh anthology features original Star Trek®, Star Trek: The Next Generation®, Star Trek: Deep Space Nine®, Star Trek: Voyager®, and Star Trek: Enterprise™ stories written by Star Trek fans, for Star Trek fans! 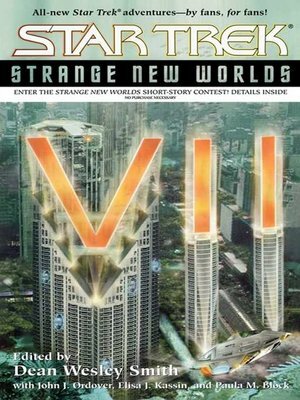 Featuring new stories by new writers and a few contest veterans, Strange New Worlds VII spans the entire Star Trek universe from the original days of Captain Kirk and throughout the tenures of Captains Picard, Sisko, and Janeway and back in time again to Archer. Each of these unforgettable stories explores the past and future of Star Trek from many different perspectives. This year's contributors include Kevin Lauderdale, Kevin Killiany, Christian Grainger, Paul J. Kaplan, Muri McCage, Pat Detmer, Gerri Leen, Julie Hyzy, Kelly Cairo, John Coffren, Scott Pearson, Jeff D. Jacques, Jim Johnson, Anne E. Clements, Russ Crossley, Susan S. McCrackin, Catherine E. Pike, G. Wood, Annie Reed, Louisa M. Swann, Brett Hudgins, Amy Sisson, and Frederick Kim.